The common name sawfish refers to any member of the family Pristidae (the sawfishes). Despite their shark-like form and manner of swimming, they are rays (batoids). These large- to huge-sized rays are characterized as having an elongate blade-like snout (rostrum or saw) that has laterally placed tooth-like denticles (rostral teeth) set into sockets. Sawfishes inhabit all coastal tropical and subtropical waters, including estuaries and river systems. How many species of sawfishes are there? There are five recognized species of sawfishes living worldwide today. 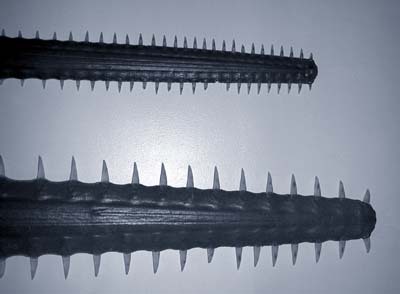 The sawfishes are represented by the genera Pristis and Anoxypristis. These species include the smalltooth sawfish (P. pectinata), the largetooth sawfish (P. pristis), the green sawfish (P. zijsron), the dwarf sawfish (P. clavata), and the narrowtooth sawfish (A. cuspidata). Scientists used the term elasmobranch to refer to members of the subclass Elasmobranchii, comprised of the living sharks, skates, and rays, along with extinct related fishes. The term elasmobranch is derived from the Greek term elasmos, meaning ‘metal plate’, and branchia, Greek for ‘gills’. Elasmobranchs have cartilaginous skeletons and between five and seven gill openings in common. Are sawfishes related to sharks and rays? Yes, in fact sawfishes are considered to be a type of ray (batoid). How long have sawfishes existed? Sawfishes evolved from extinct primitive sharks. A number of families of sawfishes, exhibiting a wide array of body modifications, once swam in primitive seas worldwide. From these diverse sawfish families arose the modern sawfish family Pristidae. Many species within the family Pristidae have since died out, and are now represented only in the fossil record, dating as far back as the Eocene Period, 56 million years ago. How large can sawfishes grow? Sawfishes are some of the largest rays living today. The large bodied species, which include the smalltooth, largetooth and green sawfishes, commonly reach 16.4 feet (5.0 meters) in length, while the smaller bodied species, the narrow and dwarf sawfishes, reach about 10 to 11 feet (3.0- 3.5 meters). The maximum length of a sawfish is believed to be 24 feet (7.3 meters). Where (in the world) do sawfishes live? Sawfishes inhabit coastal tropical and subtropical waters worldwide, including estuaries and river systems as well as the oceans. Do sawfishes live in waters off the coast of the U.S.? At one time, the smalltooth sawfish could be found along the southeast coast of the U.S. as far north as North Carolina, south into the Gulf of Mexico. However, due to range reduction, the smalltooth sawfish population is now restricted to the Atlantic and Gulf coasts of Florida. 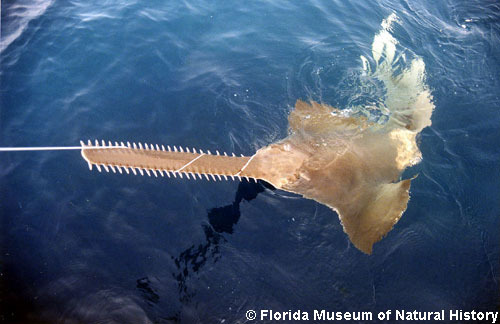 The other species of sawfish found in U.S. waters is the largetooth sawfish which is limited to the Gulf of Mexico. Why do sawfishes have that remarkable tooth-studded snout? The rostrum, often referred to as the “saw”, is used during feeding and for defense. The saw is slashed in a side-to-side motion to dislodge invertebrates from the substrate and to stun schooling fishes. In addition, the sawfish can use its saw in defense against large predators such as sharks. Do sawfishes present a threat to humans? Humans are too large to be viewed as potential prey. Care must be taken when handling or approaching a sawfish of any size, as they may defend themselves when they feel threatened, using their rostrum to strike from side-to-side with considerable force.